President Muhammadu Buhari on Monday in Abuja met with the Liberian President, Ellen Johnson Sirleaf, behind closed doors. The Liberian President would brief President Buhari on sub-regional security challenges ahead of the 3rd Dakar International Forum on Peace and Security in Africa slated for December 5 and 6, the News Agency of Nigeria gathered. President Buhari is expected to leave Abuja later today for the forum in Dakar, Senegal. 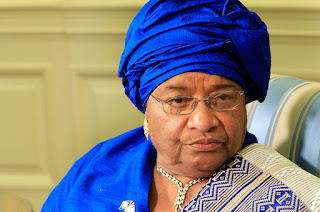 Sirleaf, who is the current Chairperson of the Authority of Heads of State and Government of the Economic Community of West African States, is expected to brief President Buhari on efforts made to curb terrorism in the sub-region. The two leaders are also likely to discuss other issues bordering on sub-regional integration and bilateral trade. The ECOWAS chairperson also held closed door meetings with the President of the commission, Mr. Marcel de Souza, former President Olusegun Obasanjo, and senior officials of the commission.